2015 has been one of the best years for my blog. I have gained a lot more readers and my posts are getting read a lot more which is nice. I have also worked a lot harder during 2015 and I am wanting to worker harder again for this year. 2015 was a great year for me and my family. Looking back brings a lot of smiles. 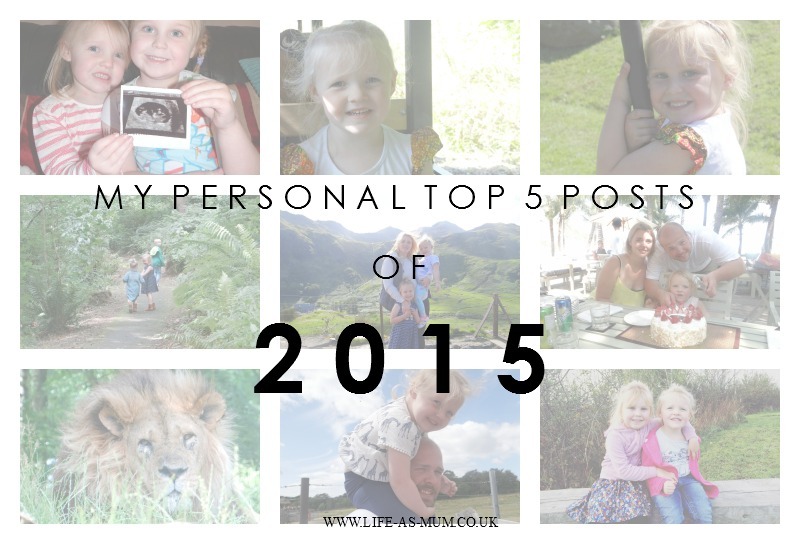 I thought I would list my personal top 5 favourite posts from 2015. Finding out I was pregnant again, for the third time was shocking but also quite exciting. My partner and I have past the shock stage and we are really happy and excited, especially since the scan after seeing Baby wriggle about. Mia and Elliw have taken it pretty well, especially Elliw. She is super excited. Mia seems to be a little unsure but I am sure she will get round to it once my tummy grows bigger. To think I our family of 4 will grow to a family of 5 in July is a scary thought but very exciting. It still feels like a long time to wait but I am sure it will fly by. In February 2015 me, my partner and the girls went on our very first holiday together with my partners parents to their house in Thailand. The whole 3 weeks was an amazing experience. When I think back about our time there and looking through the photos it makes me sad because I really want to go back and I am sure we will go back one day. The place is just amazing. I have written many posts about Thailand which you can see here. Christmas is a special time for families, especially children. 2015 Christmas was really exciting because the girls were just super excited and couldn't wait until Christmas Day. Mia was counting down the days. Which did get pretty annoying at times but was quite funny! We had a fantastic family Christmas with both sides of the family and I am already excited for this years Christmas as there will be a new addition joining us! This was a very popular post in 2015 and it brings back some fantastic memories. Especially for my eldest daughter, Mia. I really hope she remembers this when she is older but I doubt she will. I am glad I took as many photos as I could on the day. The day she got to play football and cuddle a baby elephant. We all got the chance to take a photo with an elephant and have a cuddle. The elephant was well cared for and was just so adorable. My partner, the girls and myself went away for a long weekend with my partners parents, aunty and uncle to Chester. We had a fantastic long weekend and one of the days we visited Knowsley Safari Park which was an amazing experience. The girls really enjoyed themselves and so did I and everybody else. I would really recommend this Safari Park if you have not been there before. Congratulations on baby number 3 just been reading your top posts looks like u have had a lovely year. Thailand sounds like such an amazing place to go. Sounds like a brilliant year - I only live 10 minutes away from Knowsley Safari Park but am ashamed to say I've never been! A fantastic fun filled year. I hope 2016 is even better for you and your family. What an awesome year. The elephant experience sounds amazing! Congrats on baby number 3. Congratulations on baby number 3, lovely experience with the elephant! What a fab year you've had and lovely mix of posts too. First of of all congratulations on baby number 3. You will definitely have your hands full then. I would love go to Thailand one day but the flight is just so long especially with kids. 3 hours is the maximum for me when they are so small.